Carmenta is also credited with inventing the 15-letter Latin alphabet. A temple in Rome was dedicated to her and known as the Temple of Carmentis. The right arch of this temple was called the porta scelerata, the portal of guilt, because the Fabii passed through it on their way to destruction at Cremera. 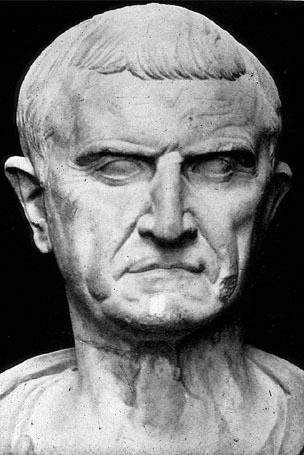 The emperor Galba was murdered this day in the Forum in 69 AD. He was 71. Otho acceded to the empire the same day. This month is sacred to Janus, the god of Beginnings. On this day also, Juturna, an old Italian goddess of fountains and prophetic waters, is honored with the Juturnalia on the anniversary of the day on which her temple was erected in the Campus Martius by Lutatius Cotulus. Juturna was the wife of Janus. She was a goddess of the underworld and is symbolized by springs, which bring forth water from below. All aqueduct workmen and others in a similar field celebrate the Juturnalia. As part of the New Year’s celebrations in Japan, the kagami-mochi, a two-tiered rice cake which was placed in the alcove of the living room or kitchen, is cut up and eaten today. This custom, called kagami biraki, originated with the samurai class. This was the day Julius Caesar crossed the Rubicon and began his successful march on Rome. His enemies fled at the news and he entered Rome to welcoming crowds. This nine-day festival, dedicated to Dionysus, was celebrated from the 12 to the 21st day of the Greek lunar month of Gamelion. Its name derives from the lenaion, the enclosure where dramatic contests were held in honor of Dionysus. At first it was organized by the basilius (king), joined by the overseers of the Eleusinian Mysteries. Starting in the 5th century, the basileus was chosen by lot from among the lower social class (like the Lord of Misrule). Lenus is the word for a wine vat but January is not a time for treading grapes. Lenai was also a name for the maenads, intoxicated female worshippers of the god who held their ecstatic dances in circles under the full moon. This day honors Geraint, the 9th century Blue Bard of Wales. Sir Geraint was the eldest son of King Erbin of Dumnonia who was a Knight of Devon. After the death of his wife, Prince Geraint spent much time at King Arthur's Court, looking for action and adventure. It was during this period that he encountered the Sparrow Hawk Knight and came to marry Lady Enid of Caer-Teim (Cardiff), a story told in the ancient tales of "Erec (alias Geraint) & Enid" and "Geraint mab Erbin". Sir Geraint restored Sir Yniol all of his possessions and then married his beautiful daughter, Lady Enid. 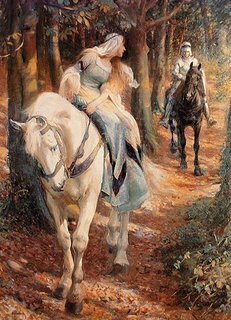 Later Geraint heard Enid bewailing his sloth as a knight; he was stung with shame and mistakenly believed Enid to be unfaithful to him. He took her on a journey through a series of trials until she convinced him of her constancy. They returned and lived in happiness for the remainder of their lives. He inherited the Dumnonian throne in c.497 (or 480) and is recorded as one of the great "Fleet Owners" of post-Roman Britain. His castle was once called Caer-Gurrel or Fort of the Ship. He died fighting the Saxons with King Arthur at the Battle of Llongborth (Langport, Somerset) around 480/510. This recorded in a long Welsh poem called the "Elegy for Geraint". In the Islamic calendar, this day is Eid al-Adha, celebrated from the 10th day of the holy month of Dhu al-Hijjah. The solemn ceremonies culminate four days later at the Full Moon in the most important of all Islamic holy days: Kurbani Bayrami, the Night of Power, honoring the willingness of Abraham to sacrifice his only son Isaac without reservation or question in one of history's most famous acts of submission, the literal meaning of "Islam". This act established Abraham among the spiritual heroes most revered by devout Muslims.